Guide to choose the location of your holiday villa to rent in North Cyprus. Below you will find short descriptions of the towns and villages in East Kyrenia and West Kyrenia. To view the rental villas in any of the locations, just click on the location name. The heart of Kyrenia is the pretty harbour, a perfect crescent built by the Venetians. Here, fishing bobs bob on the glittering Mediterranean Sea, as locals and tourists alike enjoy a strong Turkish coffee or light lunch in the sunshine. From here, it's just a short walk to the mighty Kyrenia Castle with its fascinating Shipwreck Museum, or to the Round Tower Gallery for fine arts and crafts. Stock up on fruit and veg for your holiday villa kitchen at the Municipal market, or forget cooking altogether and enjoy a romantic dinner on a Kyrenia rooftop restaurant, dining under the North Cyprus stars. Transfer Times: Ercan Airport - 30 mins, Larnaca Airport - 1 hr 30 mins. Karakum is an elegant rental villa location just to the east of Kyrenia town centre, and is ideal for those who enjoy walking rather than driving, or simply wish to relax beside the sparkling sea. Karakum has an excellent selection of local shops, and three sandy beaches are just a short taxi ride away. Transfer Times: Kyrenia Centre - 3 mins, Ercan Airport - 35 mins, Larnaca Airport - 1 hr 35 mins. Ozankoy village has a friendly welcoming atmosphere, with excellent local shops and several good restaurants. Ozankoy is only 2 miles east of Kyrenia town’s historic harbour and excellent restaurants, and just a few minutes drive from three excellent sandy beaches. Transfer Times: Kyrenia Centre - 5 mins, Ercan Airport - 35 mins, Larnaca Airport - 1 hr 35 mins. Enjoy the gentle pace of life in Bellapais, where you can simply relax in your rental villa and appreciate the stunning views over the North Cyprus coastline. The historic town of Kyrenia is just 10 minutes drive down the mountain road towards the coast, with excellent beaches only a further 5 minutes drive. Transfer Times: Kyrenia Centre - 10 mins, Ercan Airport - 40 mins, Larnaca Airport - 1 hr 40 mins. Just 10 minutes drive east of Kyrenia, Catalkoy is tucked away from the main coast road, with a pretty village centre and local restaurants. At your villa for rent in Catalkoy, you are only 5 minutes drive away from three excellent North Cyprus beaches, including Alagadi Turtle Beach. Transfer Times: Kyrenia Centre - 10 mins, Ercan Airport - 30 mins, Larnaca Airport - 1 hr 40 mins. A villa for rent in Alagadi offers you so much for your North Cyprus holiday, with a golf course, sandy beach and rare wildlife all within a 5 minute drive! Transfer Times: Kyrenia Centre - 15 mins, Ercan Airport - 35 mins, Larnaca Airport - 1 hr 45 mins. 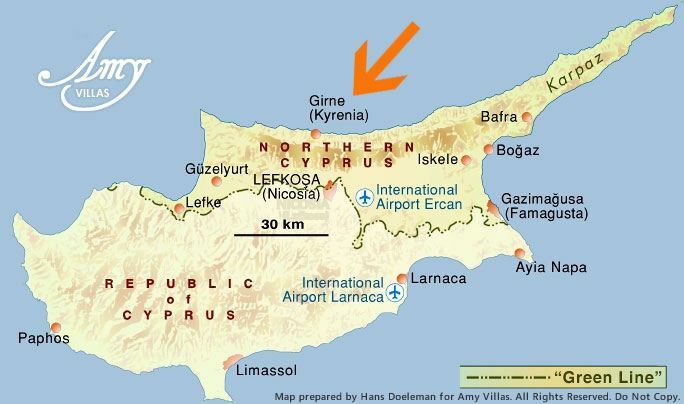 Esentepe lies east of Kyrenia towards the Karpas Peninsula, less than a mile inland from the new coastal road that speeds you back into Kyrenia town centre in just 20 minutes, or to the new golf course in less than ten minutes. Transfer Times: Kyrenia Centre - 20 mins, Ercan Airport - 40 mins, Larnaca Airport - 1 hr 50 mins. Located east of Kyrenia towards the Karpas Peninsula, Tatlisu is close to all the facilities at nearby town of Esentepe, yet still retains its quiet, village feel. The new golf course is only ten minutes drive, and historic Kyrenia is also just 30 minutes away on the superb coast road, a lovely drive at any time of year. Transfer Times: Kyrenia Centre - 30 mins, Ercan Airport - 50 mins, Larnaca Airport - 2 hrs. Located just beyond the southwest corner of Kyrenia, Zeytninlik is a peaceful rural village nestling amongst olive groves. Two sandy North Cyprus beaches are just a short drive away, as are good local shops, including a supermarket. Kyrenia town, with its museums, shops and harbour-side restaurants, is just a 3 minute drive or taxi ride away. Karaoglanoglu lies just west of Kyrenia on the coast road, and all villas for rent here are within easy walking distance of pretty coves and beaches, that kids will adore. There are good local restaurants at Karaoglanoglu, and for shopping and sightseeing, Kyrenia town centre is just a 5 minutes drive away. This small village lies west of Kyrenia, halfway up the mountain road to Karmi, so holiday villas here enjoy great views and cooling breezes. Yet just 1 mile downhill is the shimmering North Cyprus coast, with local golden sandy beaches, or an easy 10 minute drive into historic Kyrenia. Karmi - (Karaman) the prettiest village in North Cyprus? Carefully restored stone houses are covered in beautiful plants and flowers, and the village seems a world away from the bustle of Kyrenia, just 15 minutes drive downhill and along the coast road. Transfer Times: Kyrenia Centre - 15 mins, Ercan Airport - 45 mins, Larnaca Airport - 1 hr 45 mins. Two great beach clubs, offering everything from sun loungers to water sports, are just a short drive away down the hillside, and historic Kyrenia is just 15 minutes drive east. The village itself has two mini-markets for essential supplies and a good choice of restaurants. Surrounded by sweet-smelling citrus groves, the terraced part of Lapta town lies less than a mile uphill from its 'other half' on the coast, where villas for rent are a short stroll from uncrowded beaches and great value fish restaurants. Transfer Times: Kyrenia Centre - 20 mins, Ercan Airport - 50 mins, Larnaca Airport - 1 hr 50 mins. Karsiyaka is North Cyprus as it used to be; unhurried, relaxed, and with proper local shops including a butcher, baker and internet café! The local beaches and restaurants are uncrowded, yet bustling Kyrenia town is just a 30 minute drive away. Transfer Times: Kyrenia Centre - 30 mins, Ercan Airport - 1 hr, Larnaca Airport - 2 hrs. Bogaz is one of those little gems you can find on your North Cyprus villa holiday; a traditional fishing village with the wild Karpas Peninsula on its doorstep and the history of Venetian Famagusta and Roman Salamis just down the road. Famagusta is a bustling town with a walled city at its heart that’ll take your breath away. Bogaz Transfer Times: Famagusta - 10 mins, Ercan Airport - 40 mins, Larnaca Airport - 1 hr 40 mins. Famagusta Transfer Times: Bogaz - 10 mins, Ercan Airport - 30 mins, Larnaca Airport - 1hr 30 mins. Kato Paphos is the Paphos town centre area. Kato Paphos has the lot for a superb villa holiday in Cyprus, with the added bonus of cheap flights to Paphos airport and quick transfer times! Enjoy a slice of the good life at your Pafos villa, where you can relax in style or explore the town, from Roman ruins to excellent restaurants, fascinating shops to lively nightlife. Transfer Times: Paphos Airport - 25 mins, Larnaca Airport - 1hr 30 mins. Coral Bay is one of Cyprus' best beaches, with beautiful villas rising up the hillside beyond, and just a short drive or bus ride rom the historic sites and bustling shopping of Paphos town. Protected by two rocky headlands and lapped by the warm waters of the Mediterranean Sea, Coral Bay's golden sandy beach is always within easy reach of your Coral Bay holiday villa. Transfer Times: Kato Paphos - 15 mins, Paphos Airport - 40 mins, Larnaca Airport - 1hr 45 mins. Situated on the quieter northwest Cyprus coast, our holiday villas in Polis and Latchi offer peace and quiet in this less developed part of Cyprus. Chilled out Polis and laid-back Latchi are the perfect antidote for those tired of built-up Cyprus resorts. As you emerge from the foothills from Paphos, and see the sun shining on the sea beyond, you can feel your cares drift away before you've even set foot in your Polis holiday villa! Transfer Times: Kato Paphos - 35 mins, Paphos Airport - 1 hr, Larnaca Airport - 2 hrs. This page is prepared in 350 ms.